I found a scan of the original art Richard did for me for my talk on the History of Aviation and Photography. This was for a talk I gave at ISAP (International Society for Aviation Photography) V held March 3-5, 2005 in Chantilly, VA. So, as you know Richard - it was done in February, 2005. This was shown after the image of the Wright's Dec 17, 1903 first flight taken by Coastguardsman John T. Daniels. 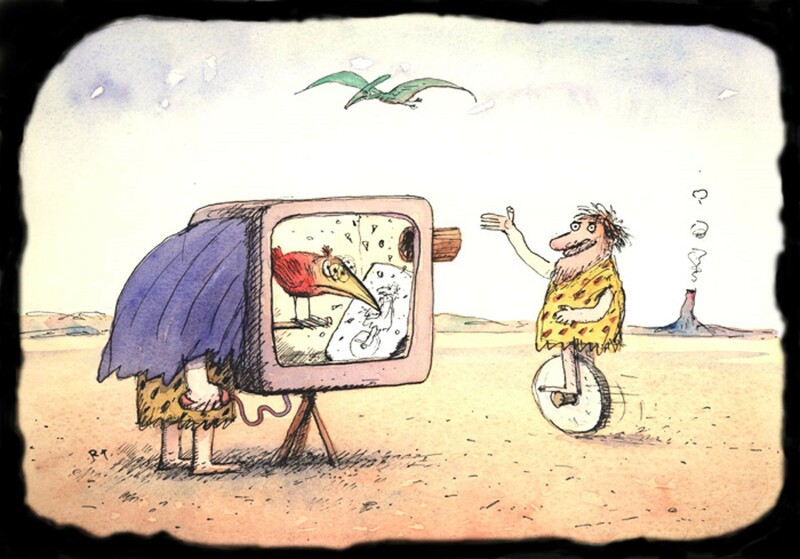 I said to Richard I needed something to show how amazing it was that we had an image of the moment of invention. 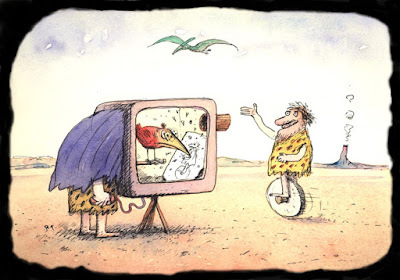 It would be like a caveman having one of those "Flintstones' cameras to take an image of the first wheel. 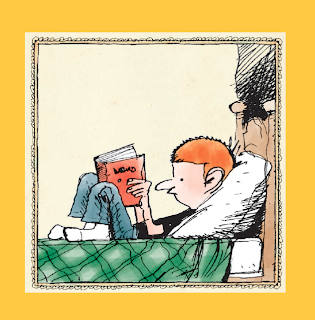 So here we have the Cronk brothers, Murray and Oog - on the first wheel - as depicted by the much loved "R.T."
A never-before-seen piece of Richard Thompson's original artwork, rarely seen even in publication, is about to go on display in Columbus, Ohio. DRAWING BLOOD: COMICS AND MEDICINE: This exhibit traces the history of comics’ obsession with medicine from the 18th century to today. The earliest cartoonists frequently satirized a medical practice dominated by bloodletting, purging, and other largely ineffective treatments. Over the next two centuries, modern medicine would go through remarkable transformations. Comics were there for the good and the bad, helping to rebrand the doctor from quack to hero, but also critiquing a medical system that often privileged profits over patients. 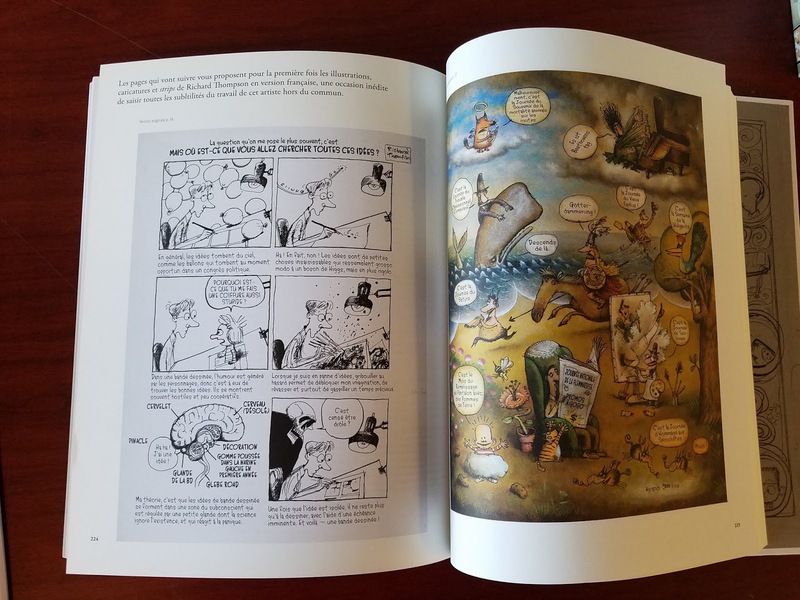 Drawing Blood highlights the sometimes caustic eye of cartoonists as they consider doctors, patients, illness, and treatment in the rapidly changing world of medicine—one which continues to present new possibilities and new challenges. The exhibit features work by a wide array of creators, from pioneers of cartooning like James Gillray, William Hogarth, Thomas Nast, and Frederick Opper to contemporary greats like Richard Thompson, Carol Tyler, John Porcellino, Alison Bechdel, and Julia Wertz. I received the above notice the other day and have already pointed out that the second exhibit is co-curated by Ann Telnaes. 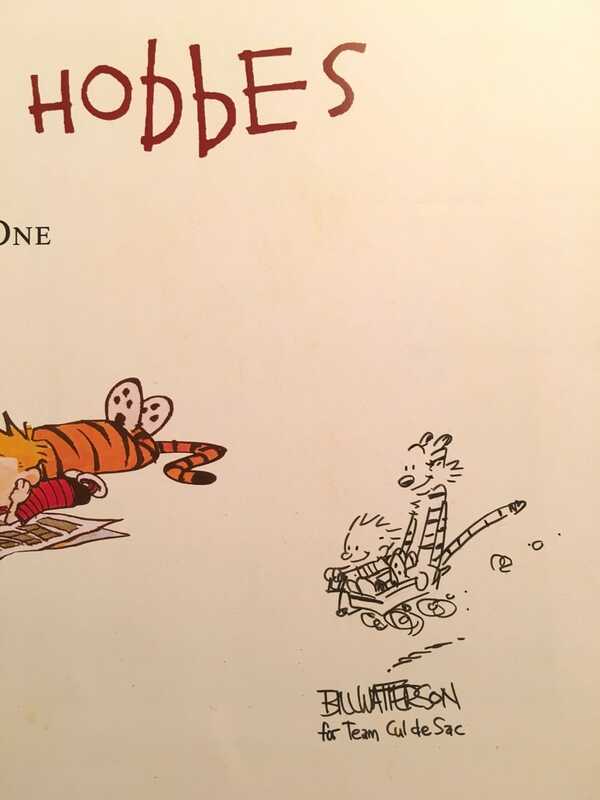 I also reached out to ask my friendly acquaintance Dr. Gardner what piece of Richard Thompson artwork he was including in the show. Curator Caitlin McGurk and the Billy Ireland did a very nice show of Richard's artwork a few years ago, and he donated material to them before he passed away, so I was curious what Jared had chosen. 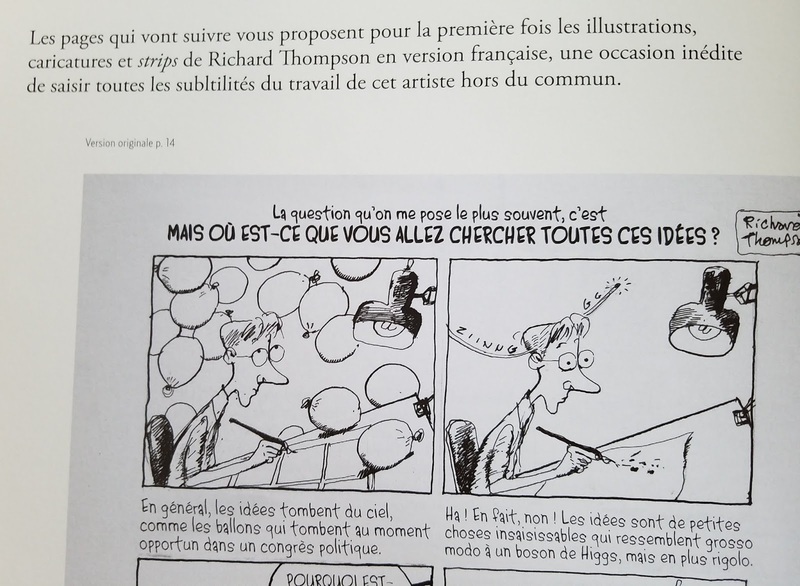 The press release says you have a piece by Richard Thompson in it. Can you tell me what it is? The piece by Richard is a loan from Kevin Wolf— it a small cartoon he did for an actuarial magazine he regularly did spot-illustration and cover work for over the years. 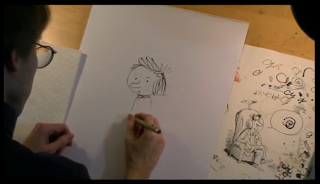 What spoke to you about the art? Were you previously a fan of Richard's? 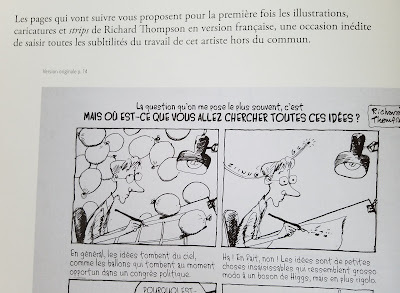 I’ve long been a fan of Richard’s work, and getting to meet him briefly during his visit to the exhibition of his work at the Billy Ireland Cartoon Library & Museum was an incredible honor. How did you select it for the exhibit, especially since it wasn't in the pieces he donated to the Billy Ireland? Kevin Wolf, the owner of this particular piece, shares my interest in comics and medicine and is a regular attendee at the Graphic Medicine conference. 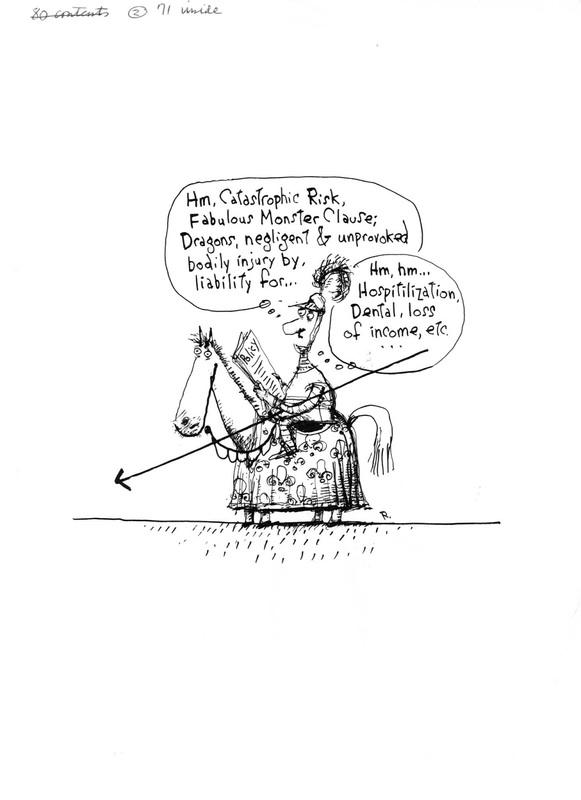 He shared the cartoon with me, a really fun gag cartoon of a knight trying to figure out insurance policy options, and he generously offered to lend it for the show. It will be featured in a section dedicated to medicine and humor, a section that will also include an early doctor’s visit by Bill Watterson’s Calvin and an page from Mad Magazine poking fun at doctors. I know the piece. As you note, it was done for Contingencies Magazine, art-directed by Richard's old friend Bono Mitchell. 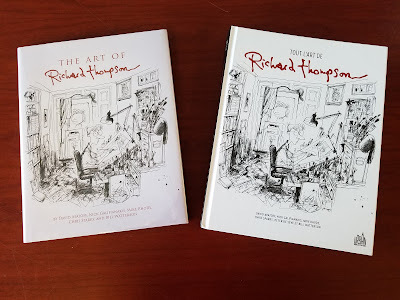 We considered it for The Art of Richard Thompson book but it didn't make the final cut. There was too much to choose from. Below is a scan we made for the book. Anything else you'd like to add about the exhibit? I guess the only other thing to add is that the exhibit begins in the 18th century with Hogarth and co. and ends with the modern “graphic medicine” movement that was kicked off with Justin Green’s Binky Brown and which is today a veritable flood of remarkable graphic memoirs and other comics about illness and healing. As of last fall, The Art of Richard Thompson is available in French (in Europe at least) from Urban Comics of Paris. 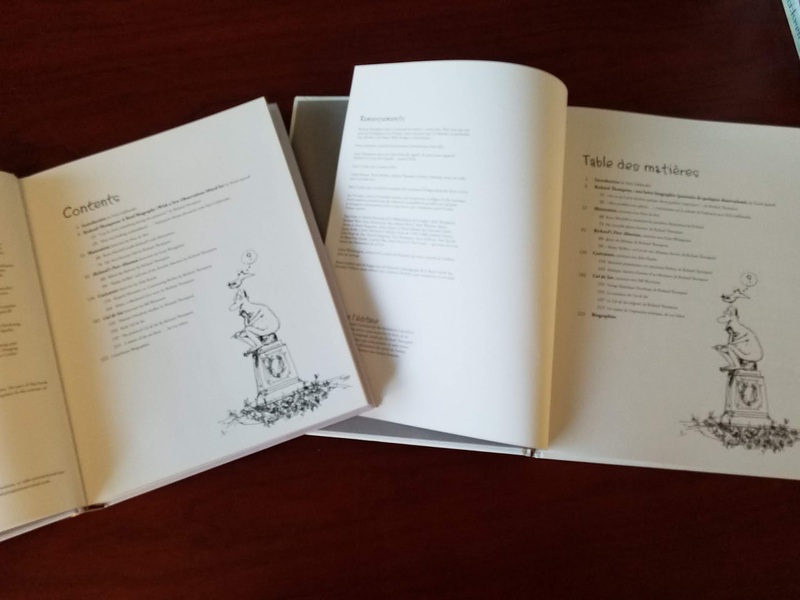 They have done an excellent job on the book production. 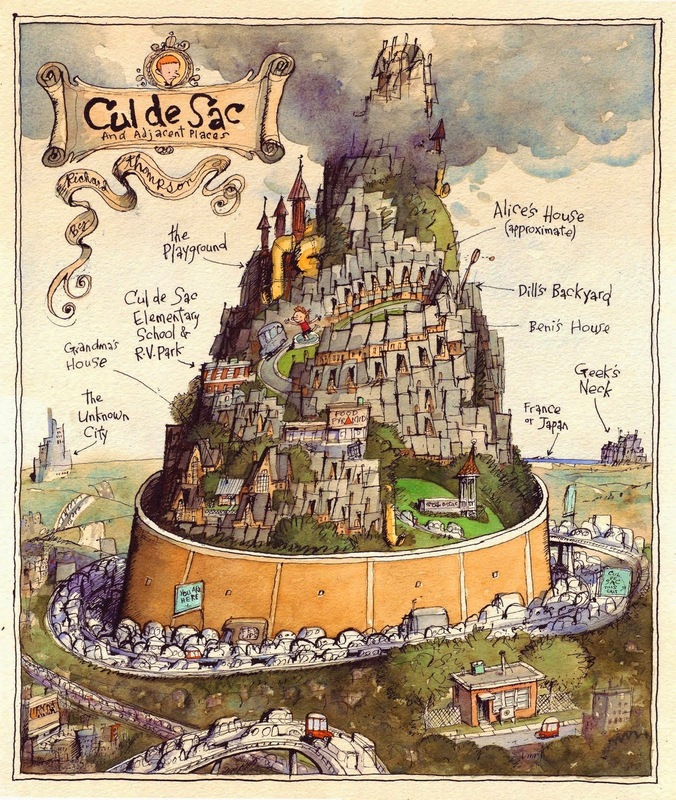 Cul de Sac is also reprinted by them in three volumes. The American version is sold out from Andrews McMeel. 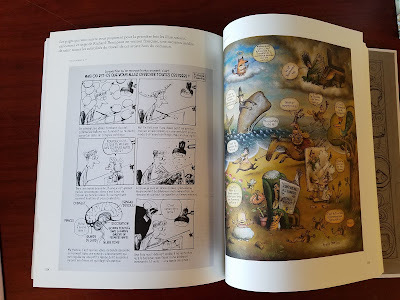 The Incomplete Art of Why Things Are (The Richard Thompson Library Volume 1) is still currently available. The note says that translated versions of the comics have been added at the back of this edition. It would sure have a niche audience, but "Reconsidering the Comics Canon." Click through to read the whole article of course.